Ginger is a spice commonly used in Asian and Indian cuisine. The thick roots of this herb have a spicy taste and a pungent aroma that add characteristic flavor to curries, Asian soups and stir fry dishes. Ginger may also offer health benefits as well, according to Michael Castleman, author of "The Healing Herbs." The chemical compounds in this herb may help reduce hypertension, or high blood pressure. Consult your doctor before using ginger to address high blood pressure. You should not use ginger in place of medical treatment for this serious condition. The chemical compounds in ginger may help lower overall blood cholesterol, as well as low density lipoproteins, which are components of cholesterol that can contribute to heart disease, according to Castleman. Cholesterol and low density lipoproteins can contribute to sticky plaque along the walls of your arteries and blood vessels. This creates blockages that can contribute to high blood pressure by restricting the inner diameter of blood vessels and arteries. Plaque may also reduce the elasticity of your arteries, further contributing to high blood pressure. Ginger may also decrease blood pressure by preventing blood clots from forming in your arteries and blood vessels, according to Castleman. Blood clots can restrict or prevent blood from flowing through your circulatory system, which can lead to hypertension. By preventing blood clots, ginger may also help prevent heart attacks and strokes. Although ginger may be beneficial for treating hypertension, it may also produce side effects. 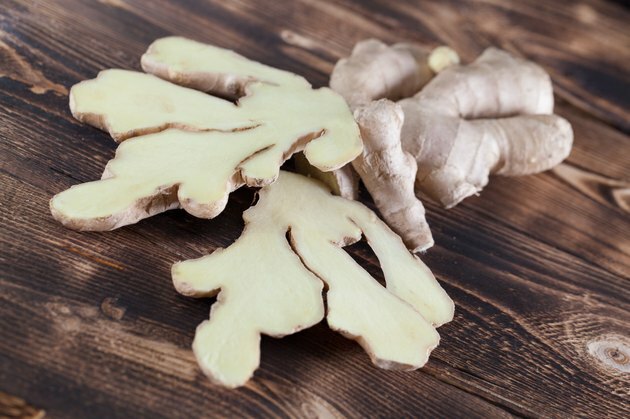 According to Dr. James Balch and Phyllis Balch, authors of "Prescription for Nutritional Healing," consuming ginger root may cause nausea or stomach upset. You may also experience heartburn if you use this herb. Can Certain Foods Lower Blood Pressure Immediately? Does Ginger Ale Calm an Upset Stomach?